Care homes are an increasingly important part of the UK's healthcare system. 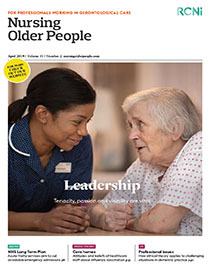 Despite their importance, particularly in providing care for older people with complex needs, the sector is often disadvantaged and overlooked by commissioners, policymakers and researchers. The authors provide an overview of some important challenges for the sector. These challenges relate to funding, education and research, overseas staff, career pathways and staff recruitment and retention. They conclude that recruitment and retention of registered nurses is arguably the greatest challenge, as high staff turnover is the catalyst for other challenges identified. The care home sector should be considered as equal to hospitals, community settings and hospices. Care homes offer registered nurses many opportunities for development of clinical and organisational skills.